Two-pocket heavyweight polypropylene portfolios / folders hold papers and resist tearing. Features business card slot. With prongs. Assorted primary colors include red, orange, yellow, green, blue, purple and black. Hi. I'm John with C-Line. And today we're going to talk about our Two-Pocket Poly Portfolios with Prongs. 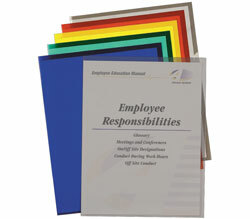 These colorful folders are made from heavyweight polypropylene that provide durable protection for your paperwork and resist tearing. The folder's feature prongs, some people refer to them as brads, to lock in 3-hole punch papers and sheet protectors. Simply flip the prongs up... [ Music ] ... and insert your pages. Now, fold the other flap down so that the prongs are inserted through the holes. Finally, fold the prongs over to hold your pages securely in place. The folders have two large pockets, and the front pocket has a place for a business card. C-Line's Heavyweight Two-Pocket Portfolios with Prongs store presentations, paperwork and more. They are great for home, school, and business. Order yours now! That's all we have for today. I'm John with C-Line. Thanks for watching.